IMPROVES VISIBILITY , REDUCES ACCIDENTS & SAVES LIVES. Aster’s rear and profile lights make you visible to motorists from all sides, front lights signal your presence in rear-view mirrors and automatic brake lights help you avoid getting rear-ended. Integrated turn signals make sure that drivers around you know when you’re making a turn. With a USB-rechargeable 8,000 mAh in-built battery, Aster can light up 10-15 hours of your commute under normal conditions. 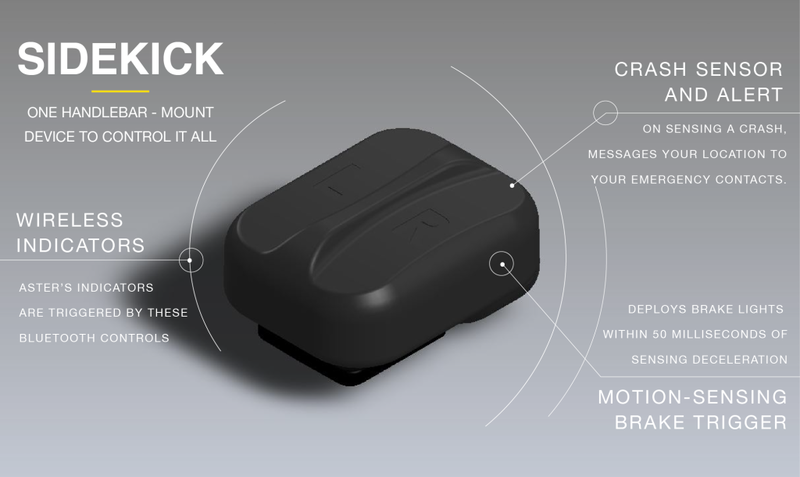 Sidekick is a handlebar remote control that activates the turn-signals, and brakes wirelessly. Sidekick can also sense if you’ve had a bag crash and send your location to your emergency contacts. Aster and Sidekick are connected to the Aster app, which allows you to customise your light settings and check your battery status. 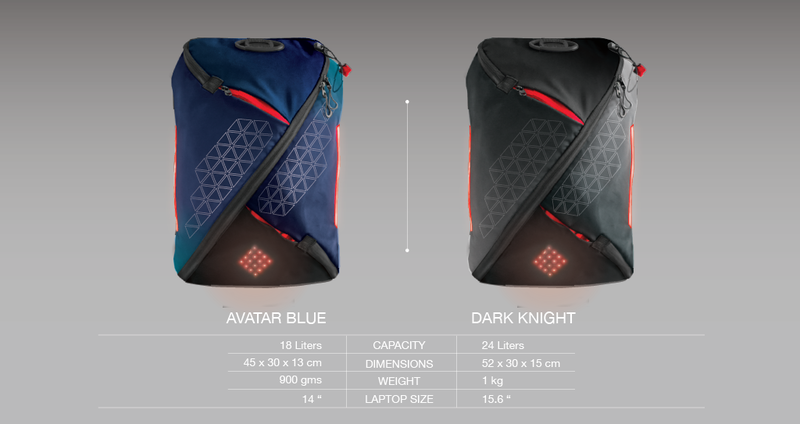 Aster comes in two striking colors, both of which come in either 18L or 24L capacity. With its sleek shape and discreet appearance, the backpack blends in at the workplace. 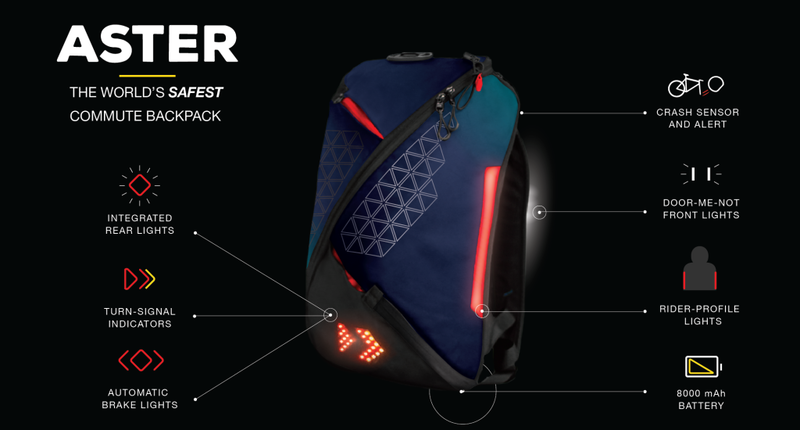 Aster has several commuter-specific compartments – a minimalist helmet holder, a whistle buckle, tuck-away U-lock holder loops, zippered bottle pockets, rain-cover and an ‘In Case of Emergency’ information slot In the event of a crash, important information such as blood type, allergens and emergency contact numbers can be accessed easily. You can pack a 15.6 inch laptop with charger, change of clothes and shoes, smaller gadgets, books, bike-tools and spares, rain-jacket, a 1-liter water bottle and even your lunch! The bag is also weather-resistant, with a waterproof TPU coated exterior and rain-resistant zippers that cause water to bead up and roll off the surface. What’s more, it makes for easy cleaning, which means you don’t have to worry about splash-back!